Around the time of VMworld, most data protection vendors are ramping up with new releases to showcase. 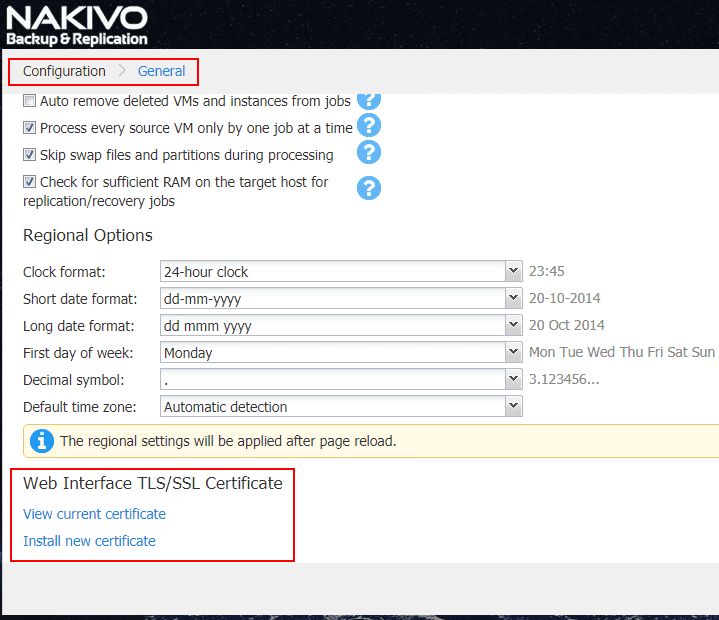 NAKIVO Backup & Replication is a great data protection solution that I have been keeping up with for a while now. NAKIVO maintains a very aggressive release cycle with new releases, features and functionality coming out very frequently, even outside of events such as VMworld. NAKIVO’s solution has been getting better with each release and it is obvious they are listening to their customers and the functionality they would like to see in each revision of the product. NAKIVO does a great job of putting out beta releases to the masses to test and try new features and functionality that are soon to be released. NAKIVO seems to always please with each release offering some pretty new major functionality. Let’s take a look at NAKIVO Backup and Replication v8.1 Beta Released with Policy-Based data protection and see how this release effectively introduces policy as part of their data protection solution. Additionally, there are other new features and enhancements to note with this release that we will take a look at. How does policy-based data protection benefit organizations today? In today’s world of complex and fast-moving infrastructure, automation and intelligent IT operations are necessary to carry out effective operations. Data protection is one of those day-to-day operations that can be cumbersome and painful if left to manually processes and intervention. Having a way to automate and add intelligence to these types of systems can greatly reduce the manual workload for IT administrators. With policy you can define a set of parameters and make sure your environment meets those parameters. With policy-based data protection, NAKIVO offers functionality that allows IT administrators to define a way to identity virtual machines that exist in their virtual environments and then automatically base jobs from those parameters set in the policy definition. Simplicity – When jobs are defined from policy, this greatly simplifies the data protection process and allows various jobs including backups, replication, and backup copies to be defined from such metrics as VM name, tag, size, location, VM configuration, power state or even multiple characteristics combined together. Automation – In today’s IT infrastructure, automation is the “king of the hill” in terms of efficient IT operations. Manual processes just simply do not scale with the needs of today’s fast moving and complex infrastructures. With policy-based data protection, NAKIVO is able to automate the process of protecting business-critical virtual machines as well as all the other processes that are required for effective disaster recovery protection such as replication and backup copies. The policy then allows the data protection jobs to be “intelligent” by adjusting which VMs are included in which jobs as things in the infrastructure change. This alleviates the need for administrators to manually perform these types of operations with changes made in the virtual environment. When virtual machines are added to the environment, as long as the VM matches the configuration of a particular policy, it will automatically be protected. More Efficient Use of Time – Time is something that most infrastructure engineers and IT admins do not have enough of. 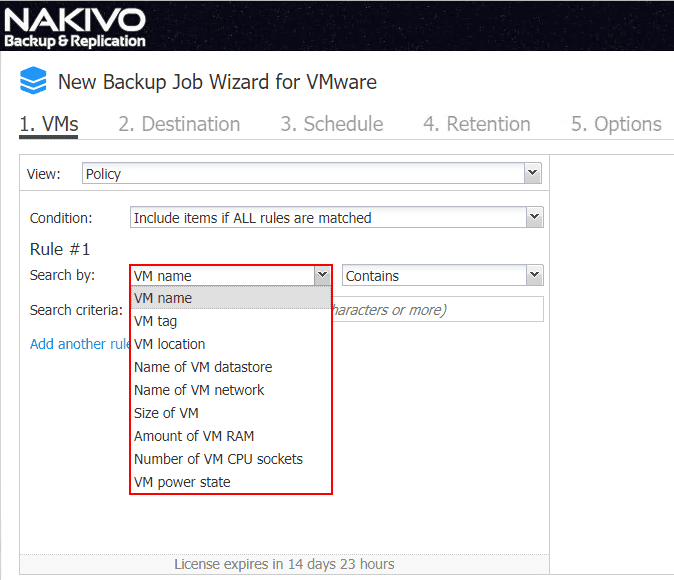 The policy-based feature of NAKIVO Backup & Replication v8.1 frees up IT admins from having to micromanage the infrastructure and data protection jobs and allows the policy-based functionality to assume the meticulous details of these types of mundane operations. NAKIVO’s interface and workflows are extremely easy to navigate and implement the various components of the solution. The policy-based data protection jobs are no exception. 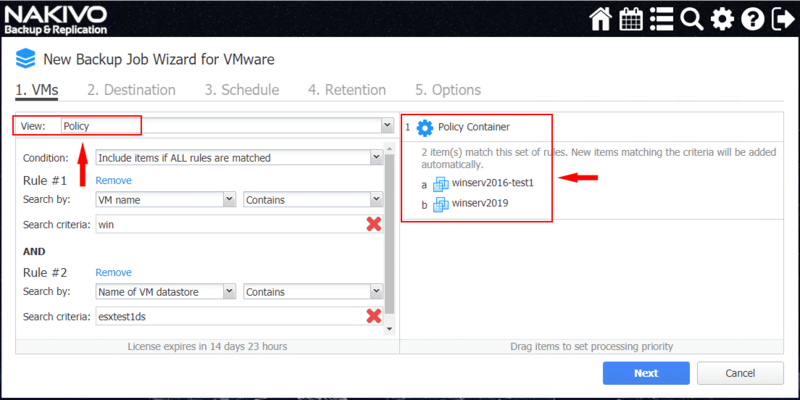 In fact, with only a few clicks through the creation of a job (backup, replication, backup copy), you can easily implement a policy-based configuration that automatically defines the VMs that will be protected. 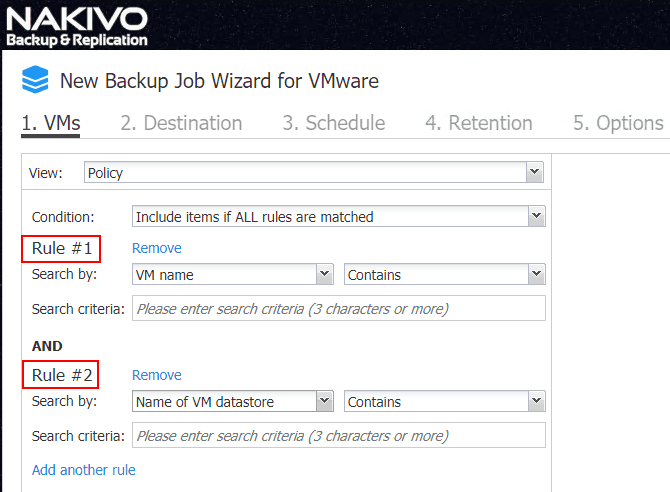 Let’s take a look at how the Policy-Based Data Protection feature is implemented in NAKIVO Backup & Replication v8.1. In the View drop down menu, select the Policy option. Note the Add another rule link at the bottom of the rule that allows stacking the rules using multiple criteria. 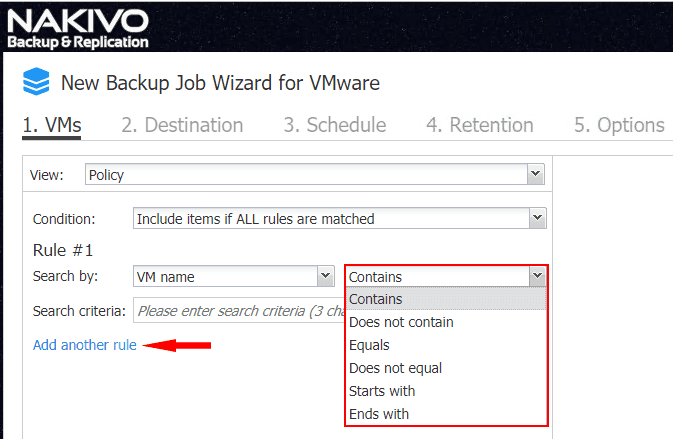 Once you click the Add another rule link, you can create as many rules as you like to define the policy rule that affects which VMs are added to the particular data protection job. As you can see below, there are a couple of virtual machines that were found based on the policy rules defined in the policy-based data protection rule. These will be displayed under the Policy Container pane. One aspect of the policy-based data protection criteria I would like to focus a bit on is the aspect of tag based VM identification. 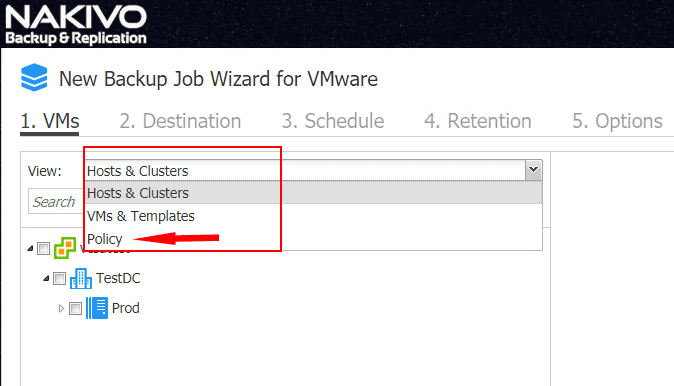 Tags are an extremely powerful construct within VMware vSphere and is a mechanism that is certainly underutilized IMHO. Especially used in conjunction with software such as NAKIVO Backup & Replication that can consume the tags construct, tags in VMware vSphere are very powerful. 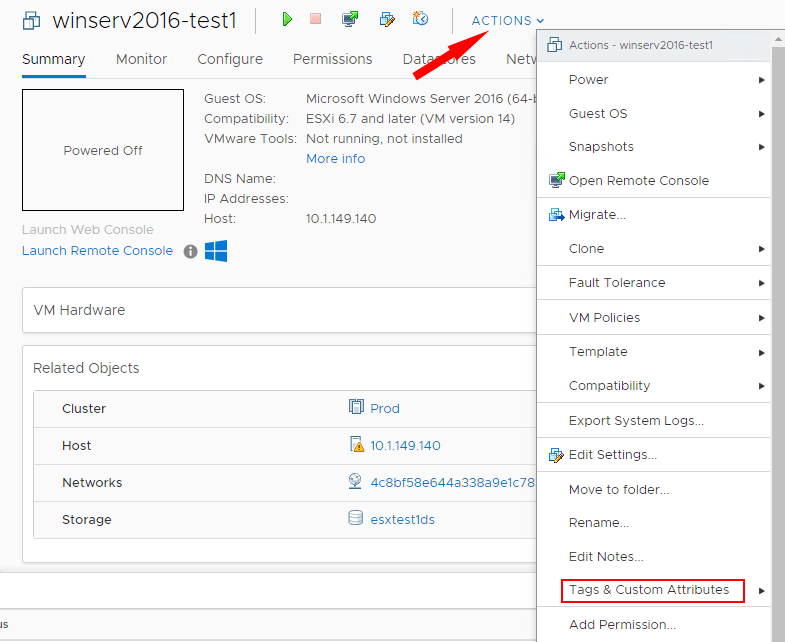 Let’s quickly walk through how tags are created and assigned to VMs in case you are unfamiliar with the process. There are many ways to get to the Tags administration. However, an easy way is to navigate to Home > Tags & Custom Attributes section. Click the New link to create a new tag. 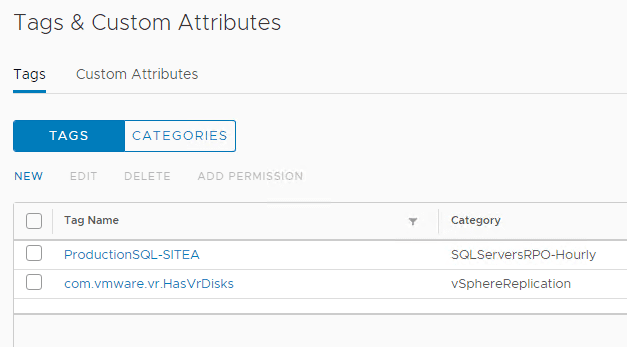 Here we are naming the tag in a way that will help identify a specific type of VMs located in a particular site. Also, we can use the Create New Category button to create a new category for the tag. 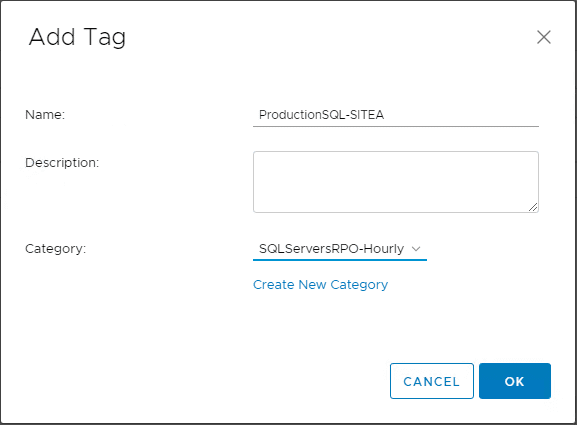 Below, the SQLServersRPO-Hourly category will house any tags we want to associate with that particular RPO value or any other descriptive attributed we want to assign. Lastly, we associate the new tag with the new tag category. The new tag is created along with the new tag category. 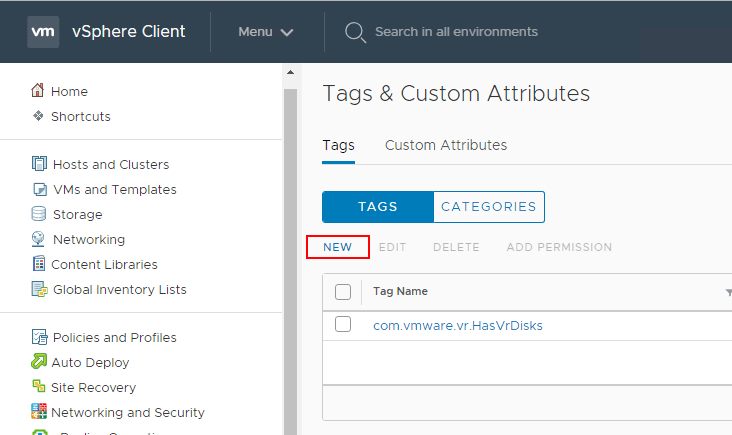 To assign the tag to a VM, click the VM in the vSphere client and choose Actions > Tags & Custom Attributes > Assign Tag. Choose the newly created tag and click Assign. 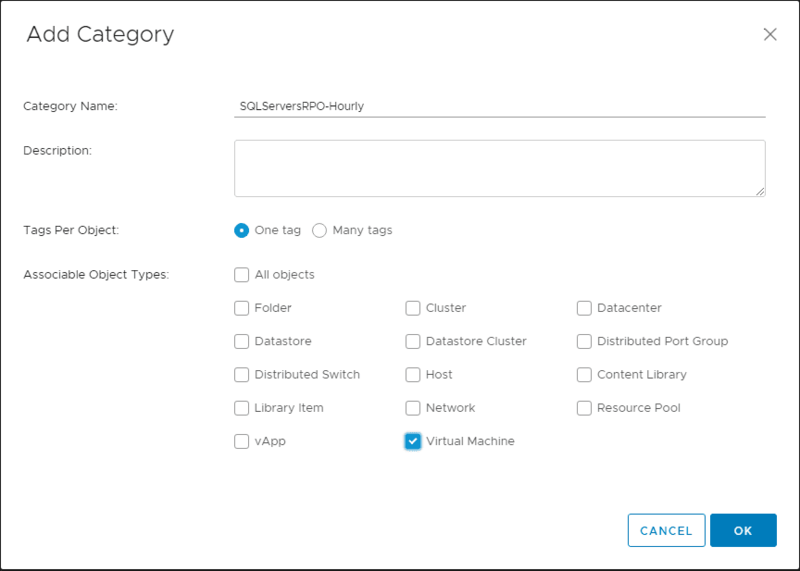 Now that we have the tag assigned to the virtual machine, it can be used to create a policy-based data protection job to find virtual machines that have that tag associated. 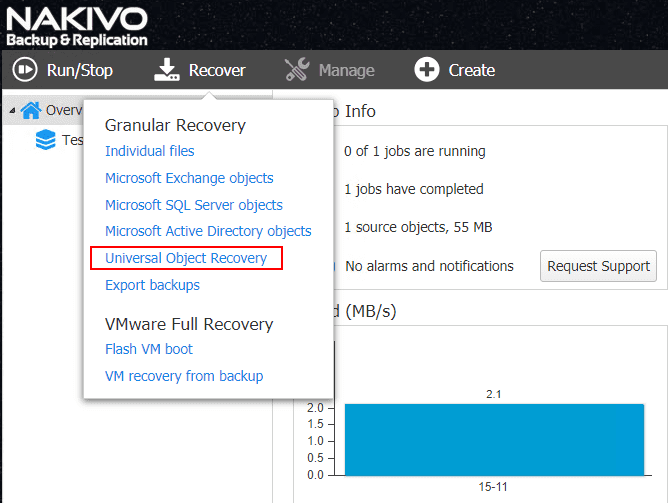 The Universal Object Recovery mechanism allows recovering any object in the virtual infrastructure, regardless of the application or file system in a matter of minutes. You simply mount the most recent backup to a VM and then recover the necessary data with native application tools. There is also a new feature now that makes SSL certificate management much easier. This will certainly make life easier in securing the web interface with a proper SSL certificate. NAKIVO Backup and Replication v8.1 Beta Released with Policy-Based Data Protection provides a step further for a really great data protection solution that is cost-effective, easy, and intuitive. NAKIVO provides a solution that allows its customers to satisfy all the requirements of the 3-2-1 backup methodology, providing the ultimate protection for business-critical data. This includes strong public cloud integration and seamless ability to copy backup data across hybrid environments. The new policy-based data protection feature serves to greatly extend NAKIVO’s ability to provide an effective automated data protection solution. It allows for data protection jobs to be dynamic in nature and dynamically and automatically add or remove virtual machines from data protection jobs as the policy rules apply or no longer apply to VMs in the infrastructure. 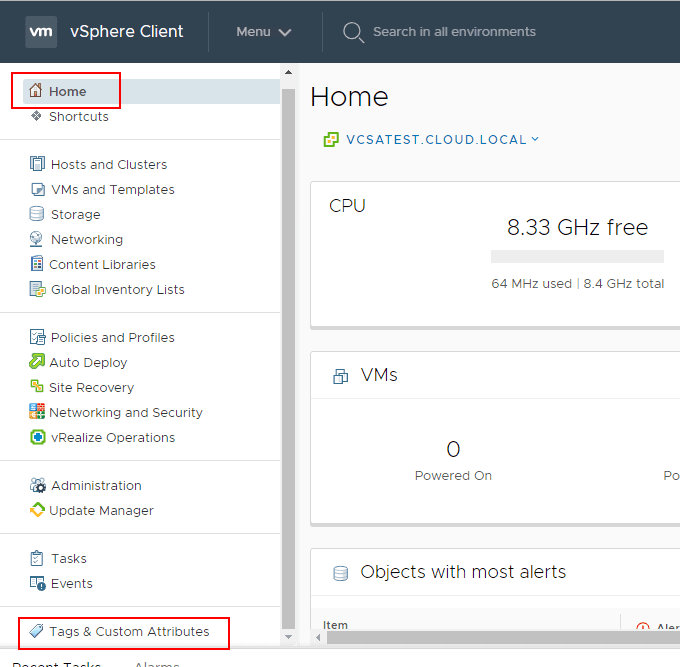 Used in conjunction with VMware vSphere tags, you can use very effective metadata in the environment to automate backups in VMware vSphere. Other enhancements such as the Universal Object Recovery mechanism and the newly enhanced mechanism for configuring the SSL certificate for the Web UI are welcomed additions. 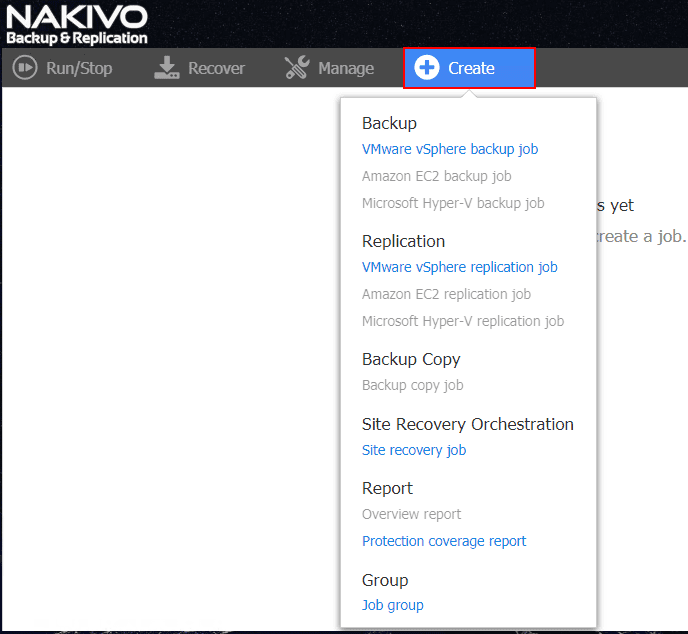 Be sure to download and check out and sign up for the NAKIVO Backup & Replication v8.1 Beta Program here.